« Digital Dependence & Social Intelligence: Is Siri Dumbing Down Our Humanity? Don’t go from OVER-scheduled to UN-scheduled! Children (and many adults) thrive on the comfort and security of structure. The key here is to create a summer schedule that delineates big, wide swaths of time for gentler-paced, vacation-worthy activities. Create islands of slowness within your days. Using ideas from the list in Idea #5 (in Pt. II of this post, tomorrow), you might choose a “main attraction” activity for a given day — maybe even that day each week. For example, “Wednesdays are beach day…” “…Fridays are blueberry pancake breakfast day…” and so on. But avoid the epidemic trap of wall-to-wall scheduling. As Uncle Max in Sound of Music wryly points out, “Activity suggests a life filled with purpose” — but it’s actually when we slow down, sink more fully and deeply into even the most humble, “unexciting” experiences, that we can find more meaning and purpose in daily life. And summer is the perfect invitation to cultivate this kind of presence in so many ways. 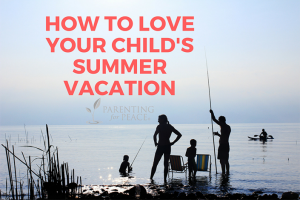 Summer vacation offers you the opportunity to slow down, get more present, and devote time and attention to the foundations of your relationship with your child(ren). Do you remember the last time you greeted your child in the morning with “eyes of delight”? To see his worthiness reflected this way off your face is one of the greatest lifelong gifts you can give him, and yet the rush-rush morning pace of the school year — and so much of life in general — can steal away these moments. Keep in mind that our kids will rise to our lowest expectations or reflections of them! 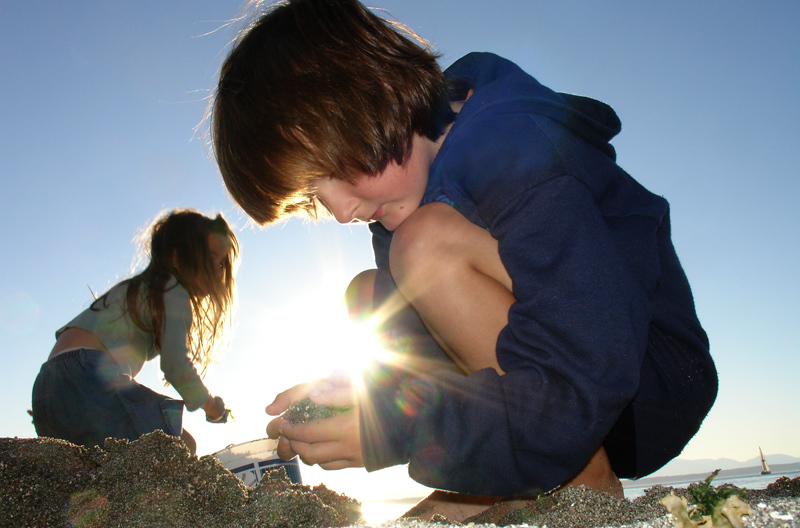 Time to simply enjoy your child… to really listen to his point of view… to have silly, low-tech fun with her… often falls by the wayside during busy, school-year season. A wading pool or sprinkler in the backyard, you in a chaise-lounge (maybe sneaking up with a bucket of good-natured splashes from time to time?) is just one of many simple summer recipes for nourishing connection with your child. And you may be pleasantly surprised to notice that unpleasant or oppositional behaviors magically resolve themselves as you keep making these kinds of “deposits” into your relationship account with your child. Children are hardwired to cooperate with people with whom they feel a strong connection; as your child feels an ever more secure, authentic connection to you, he or she will instinctively behave more harmoniously! 3) Befriend “Boredom”: A Boon for Your Child’s Wellbeing! It has become one of the baddest bad words in our culture: boredom. We stave it off at all costs. One way I see this happening is when we provide screens to occupy children, even in environments that offer plenty of naturally occurring, “real time” stimulation! Like most parenting pitfalls, this is well-intentioned yet potentially harmful: fending off all your child’s “boredom distress” can carry serious costs down the line. For one thing, a child’s budding imagination thrives on some mental down-time; the imagination of a constantly-entertained mind can atrophy from sheer lack of use! But even more critical to your child’s lifelong success and wellbeing are the self-regulatory capacities that are part of her social brain functioning. Your child’s self-regulation system needs to be worked and practiced to fully develop. This calls for some interludes of [gasp] bordom, which are essential for the fully articulated wiring of the brain circuitry responsible for her future capacities to manage and balance her emotional states — stress, disappointment, boredom, pleasure — from the inside out. This will serve (not too many years from now!) as a significant protective factor against high-risk behaviors, which are ways of attempting to manage such emotions from the outside in. All parents hope that their children will be interesting people as they grow up, but it’s even more important that citizens of a peacemaker generation be interested people. Children who benefit from the recurring opportunity for “constructive boredom” become teenagers who can scarcely understand the notion of boredom, because their interest in the world is so robust! This entry was posted on Friday, May 26th, 2017 at 10:01 am	and is filed under Parenting for Peace. You can follow any responses to this entry through the RSS 2.0 feed. You can leave a response, or trackback from your own site.